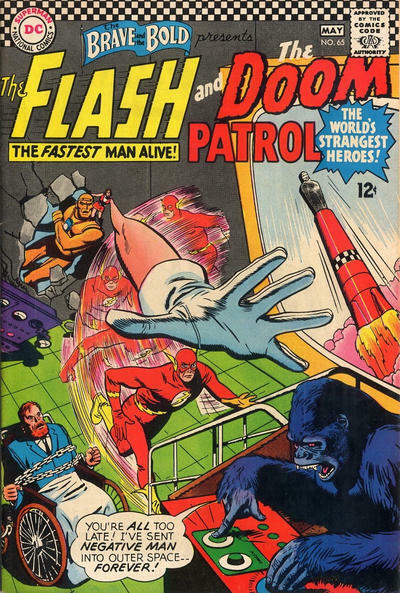 Okay, catching up (which is ironic given the Flash's appearance here), but not a long post. It's nice to see the DP taking part in the greater universe they inhabit, and to see them work with another superhero. The Flash is put to good use here in tricking the Brotherhood of Evil, but it's an off-hand remark by Rita that really makes this comic important: she claims that her powers are killing her. Now, I know it's been a while since I read the first Doom Patrol stories, but I have absolutely no recollection of this being mentioned anywhere else. I'll have to keep a close eye out moving forward, though things are about to get weird with the least desirable wedding I can possibly imagine in the next issue of the team's own title.